On Television | Carpe Cakem! I think I’m beginning to warm up to this perspective on television. TV was not really permitted when I grew up. I got to occasionally snag an episode of Duck Tales and if I was allowed to stay up, Star Trek: TNG. I used to love going to Grandma’s house. It was there I discovered Law and Order reruns on A&E. In college I watched absolutely nothing. My wife and I have always owned a TV, but the only channel we get is PBS. This past year though, we have started watching Survivor online. I had never seen it before then. I was surprised to find that I enjoy it a lot. It’s especially nice being able to watch the episodes at any time with virtually no commercials on the CBS website. The current season is over, so now we have switched to it’s summer replacement, Pirate Master. The idea is really fun, but it just doesn’t work quite right. The cast has a high concentration of oddballs, the challenges are (so far) all the same, and there are no sea battles or sword play! 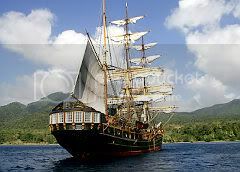 There is however a real ship, sailing, treasure hunting, and rum. I want to see what happens, but unless it improves I doubt it will ever get past its maiden voyage. Previous PostPrevious Defining Worship (Part 2): Dictionaries, love, and action.